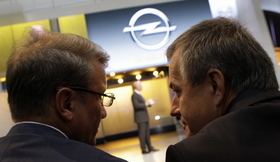 The key men behind Opel's future are Sberbank CEO German Gref (left) and Magna co-CEO Siegfried Wolf. SOCHI, Russia (Reuters) -- Russia's largest automaker, AvtoVAZ, may join state-run lender Sberbank and Magna International Inc. in a deal to control Opel and bring new technology to Russia. Sberbank CEO German Gref said AvtoVAZ could be part of the landmark Opel deal, including producing parts for a new low-cost car. "Cooperation is possible ... We are very interested to stabilize the situation on AvtoVAZ because it is our big client," Gref told reporters. AvtoVAZ makes car for Lada, Russia's top-selling brand, which has been hit hard by the slump in the country's car market. The company plans massive layoffs despite an unprecedented cash injection from the state. "What we have been talking about in the (Opel) consortium is that we should create a special budget model for the Russian market," Gref said. "We can cooperate in car parts production." New-car sales in Russia have fallen 50 percent this year following years a huge growth. Most of the recent gains were due to strong sales of non-Russian cars as local customers ignored AvtoVAZ's and GAZ's models because they are considered outdated and clunky. One of the reasons Sberbank joined Magna to get Opel was to get access to technology that will help domestic automakers make urgent reforms to their businesses. GAZ Group, part of indebted entrepreneur Oleg Deripaska's Basel conglomerate, has already said it wants to be an industrial partner in the Magna/Sberbank deal on Opel. But AvtoVAZ, which is 25 percent controlled by French automaker Renault SA, has never been mentioned as seeking a role in the Opel deal. AvtoVAZ plans to cut 5,000 jobs and its workers have threatened mass protests, a rare event in Russia, which has enjoyed a decade of stability during the economic boom under former president and current Prime Minister Vladimir Putin. Canadian supplier Magna and Sberbank won a deal for control of Germany's Opel and U.K. sister brand Vauxhall last week after months of negotiations with Opel parent General Motors Co. The Kremlin has said Washington's green light for Russian investments in GM's European arm showed President Barack Obama's willingness to improve business relations with Russia. The Kremlin says the deal would bring new technology into Russia to help modernize its economy and cut its dependence on commodities sectors.